Don’t kid yourself – cost reduction is complex! Organisations are complex systems, often far more complex than they appear in organisational charts or functional business unit descriptions. When introducing improvements and change, particularly for cost reduction projects, you need to be aware of the inter-relationships across the organisation to ensure you plan for impacts and deliver true value to the organisational system. Overlooking these inter-relationships means you risk missing your cost reduction targets and creating unintended consequences that erode the benefits you were aiming to achieve in the first place. Typically, we organise organisations in functions, for ease of resourcing, reporting, business unit structures and management. This also helps with ease of decision making. We create products and services, and choose where in the market to position ourselves in terms of cost, brand, service and bundle it under marketing. We then work out where to advertise to build brand awareness and generate interest for sales. Under the sales function, we create multi-channel engagement modes to offer our customers, a channel of their preferred choice to purchase the right product or service, be it via web, mobile, bricks and mortar or by phone to call centres. A way to measure the efficacy of our marketing and sales effort is to combine the costs, and divide into new clients over the period, which becomes the cost per acquisition measure. Now you have won your client’s business, they have the right product and service to suit their needs, it’s over to client delivery. Add every cost up that relates to onboarding and servicing the client then divide it into the number of clients and that’s your cost per client. Then we move over to shared services. This is all the other costs an organisation incurs. These have various names – overheads, head office, shared services, back office – but they all refer to the same types of costs. Add up all these costs and then divide them into the number of clients and you get an overhead cost per client. If we start to pull costs out of the functional areas without well considered and executed improvement projects to offset them, you will kick off a chain reaction that will have adverse outcomes. If we pull out resources from marketing and sales, we’ll eventually have an impact in revenue as less potential customers know about us over time. If we pull out resources from client delivery, the client experience is likely to be impacted, often immediately. If we deplete shared services, eventually the staff experience will be impacted, which eventually leads to poor customer experience. For example, antiquated technology systems, lack of HR support, little or no reward and recognition, little or no management oversight, cheap coffee in the staff room. The ‘organisation by function’ model is simple, and is very helpful when running your business. But as you all know, your organisation is far more complex than a two-dimensional view of four functional business units, especially when it comes to choosing which projects to do to reduce operating expenses and executing that project without unintended consequences. Costs are part of a complex system. In the image below we are depicting a 3-dimensional version of an aged care residential facility, to show it from an input, output and outcome perspective. 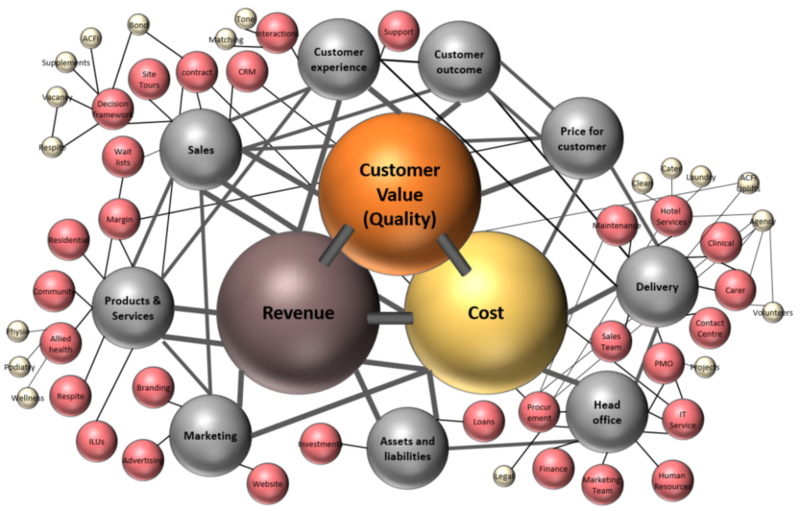 Revenue streams are the inputs, costs are the outputs, and customer value is the outcome. We connect some of the relationships that exist between components, because in systems, it is the interrelationships that create the outcome and where unintended consequences occur. There is also a fourth dimension; TIME. The organisation you left yesterday will not be the same organisation you arrive at tomorrow. Time, change and sustainability into the future due to external and internal changes are all a part of that fourth dimension. The intent of drawing out the complex system is to identify components of the system that are likely opportunities for improvement, but also to keep in mind the outcome to be achieved and the linkages into the rest of the organisation. As you can see below, we’ve drawn out the interrelationships from one third level component that has a cost reduction opportunity attached to it. The details are specific to the organisation and industry, and are for illustrative purposes only. It is helpful to understand the different relationships of the components through to how they impact Value, Revenue and Cost, both positive and negative throughout the organisation. Once understood, we can professionally take an improvement project from feasibility to completion increasing the likelihood of success. Unintended consequences: if you make a change in one area of a system, it will cause impacts throughout the system. These could be minor, or could be significant. The famous ‘butterfly effect’ from chaos theory is the concept that small causes can have large effects. This is due to feedback loops and their strength, and tipping points throughout the system. Feedback loop: the impact of a change in a system can have an immediate effect, or it could have a lag effect of days, weeks, or years. For example, if you completely stopped advertising, how long would it take before brand was diminished to the point of hurting sales? Systems principle: maximising the performance in a component or area of the system does not maximise the performance of the system. “Don’t rob Peter to pay Paul”. In summary, you can think of your organisation in terms of functional business units for ease of running the business. 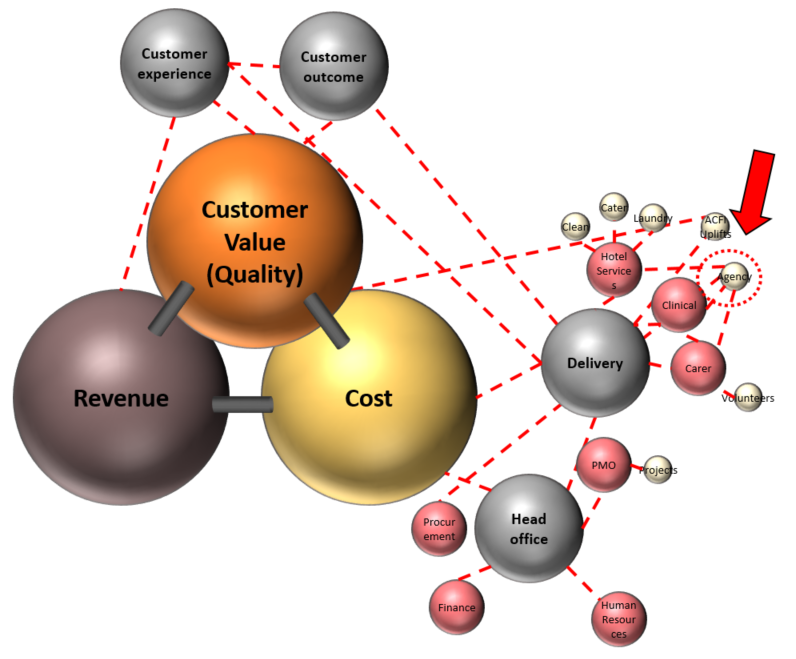 However, when you are looking to introduce change to any of the major dimensions of cost, revenue or customer value, think of it as a complex system. When you find a component you want to improve, in this case a component that is a likely strong cost lever, be aware of all the interrelationships, predict where adverse effects might be so you can mitigate them and be on the lookout for unintended consequences. If improving your business is a critical part of your role, get in the right head space by giving respect to the complexity of the challenge, and then get on and do it!